Heavenwood Farm has been owned and operated by Steph and Mike Spiece since 2005. Our son, Zachary, is now 8 and shows his passion for horses in many ways! He helps feed the horses and enjoys riding Marshall and Mickey on trail rides, at home, and at shows. 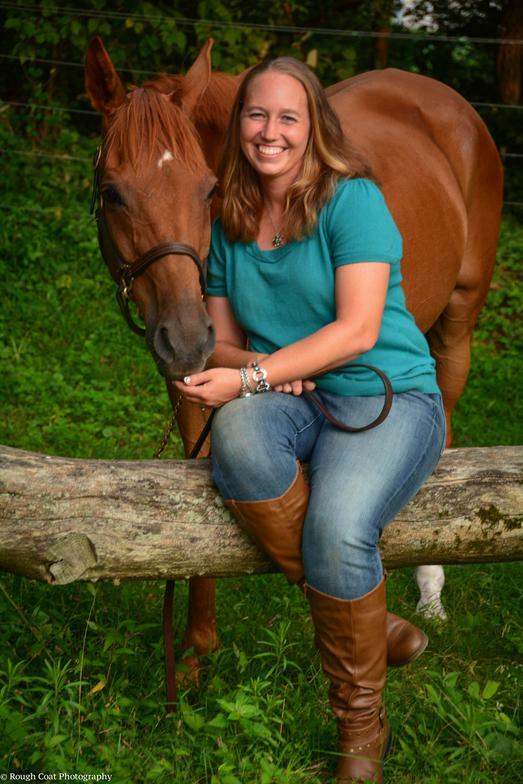 Steph has been riding and training horses for over 28 years. She started out in the Hunter ring but took to Eventing shortly after moving her first horse, Junior, to Westwynd Farm in 1997. For her, nothing beats the thrill of galloping through the countryside taking jumps out of stride. Steph was introduced to Pony Club after moving to Westwynd and was a participating member for three years before she started college. She has ridden with well known event riders such as Mary Schwentker (who got her hooked on eventing), Sally Cousins (leading lady event rider in the US for the past 6 years), Lucinda Green (British eventing Olympian), and Steuart Pittman. 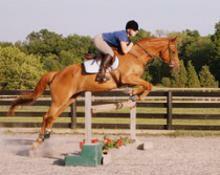 She has also audited clinics by well known eventer Jimmy Wofford and dressage riders, Julio Mendoza and Betsy Steiner. 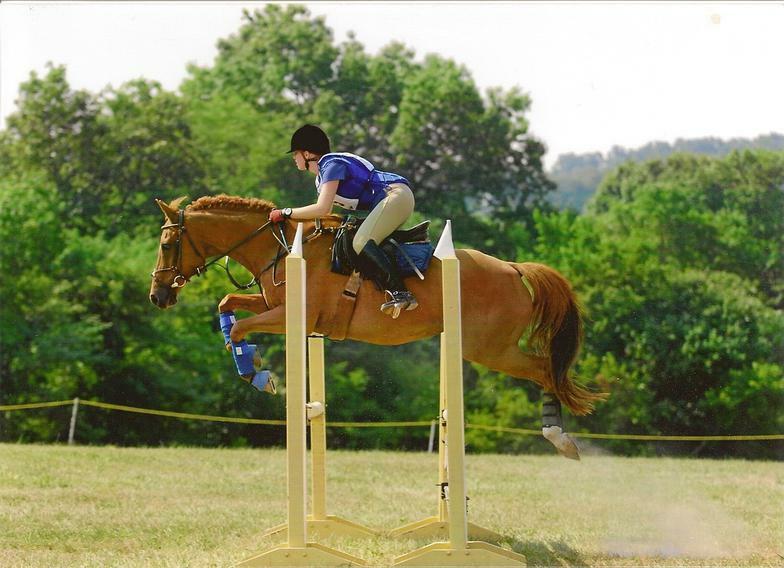 She has competed up to Prelim level and is riding regularly with Sally Cousins. She is also currently teaching lessons here at Heavenwood, travelling to some local barns, and training some of the farm's younger horses. Mike is more content with riding for fun and seeing how versatile his western saddle can be. He enjoys paper chases and trail riding with our family. 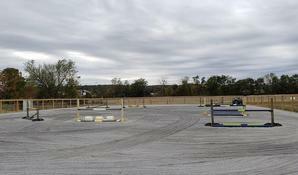 Our farm has a lighted stonedust arena and pastures with cross-country jumps including a bank jump, a ditch, and some other lower level fences. Our resident greeters are a Weimaraner (Cooper) and four very dedicated barn cats (Emmy, Surro, Max and Auggie). 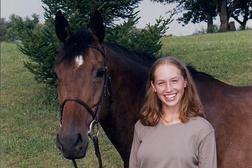 Heavenwood Farm was named after Steph's first purchased horse, Junior, who was shown under the name "Heaven Sent" and the wooded area surrounding the farm in privacy. We like to think of this place as our own slice of heaven! Junior was laid to rest after losing his battle with cancer in 2012. He was an extraordinary equine who left hoofprints on each life he touched and who will always be remembered fondly by so many. Sadly, we said goodbye to our beloved Willie in March 2016. 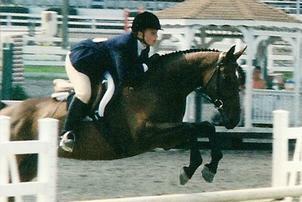 Willie Make It "Willie" was Steph's 23 y/o Thoroughbred who had rightfully earned his retirement in his later years. 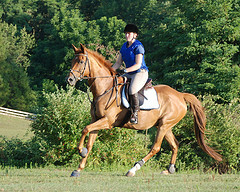 He was one of the most talented horses that Steph has had the privilege of riding in her career and was her partner all the way up to the Preliminary level in Eventing. He earned high praise from top eventers Lucinda Green and Sally Cousins and won many awards for Steph over the years. He will now run in peaceful, green pastures with his best buddy, Junior.